Love going to OU/TX but hate dealing with all the traffic???? 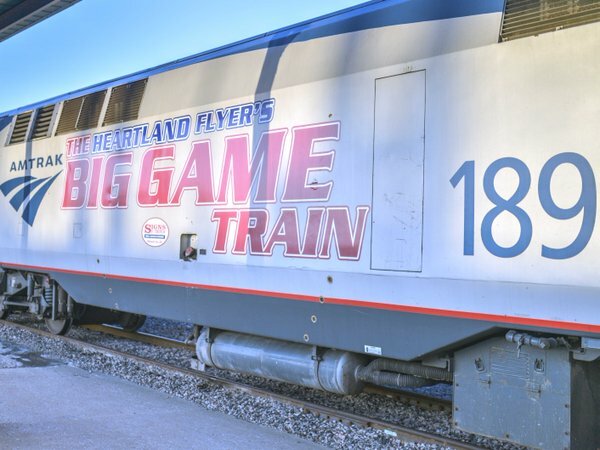 The Heartland Flyer is offering up the Big Game Train for the Red River Shootout set to be played on Sat, Oct 14 2017. Amtrak is going to have their one-way fares between OKC and Dallas for $31. That’s just $62 per person round-trip! These rates are only good for travel Oct 13-15th. Remember, the Heartland Flyer has regularly scheduled stops along the way in Norman, Purcell, Pauls Valley, and Ardmore. In Texas, it will stop in Gainesville and Fort Worth. Don’t wait! Seating is limited! For additional information, questions, fares/schedules, or to book your tickets just visit Amtrak.com and use PROMO CODE V763 or call 1-800-USA-RAIL. Promo Code good for booking travel on the Big Game Train only.